The 2019-20 federal budget is expected to forecast a surplus of $45 billion over the next 4 years and the economy to grow 2.75% in 2019-20 and 2020-21. Revenue is expected to be $513.8 billion – that is a 3.6% estimated increase on revenue from 2018-19. The Government wants to double the non-refundable low and middle income tax offset (LMITO) which is expected to increase from $200 to $255 for low income earners and from $530 to $1,080 for middle income earners. This will mean a tax reduction for individuals in which taxpayers earning up to $126,000 will benefit from this tax cut. If you are a dual income earning family, you could receive up to $2,160. It is expected more than 10 million taxpayers will benefit, with 4.5 million receiving the full amount for the 2018-19 year tax year. The Government will be imposing strict compliance obligations for ABN holders who wish to retain their ABN. Currently ABN holders can retain their ABN regardless of whether they are meeting their income tax return lodgement obligations or if their details are not up to date. From 1 July 2021, all ABN holders will need to lodge their income tax returns by the due date and from 1 July 2022 confirm the accuracy of their details on the Australian Business Register annually. These new measurements will make ABN holders more accountable for meeting Government obligations. Small to medium businesses that run through a company structure are expected to see the Government fast tracking the tax rate down to 26% next year and then down to 25% by 2021. The current small business tax rate is 27.5%. It was only 29 January 2019 when the Government announced it will increase the small business immediate asset write off from $20,000 to $25,000 (note: this Bill was introduced to the House of Reps 13 February 2019 however has not passed) which was to take effect from 29 January 2019 to 30 June 2020. This budget announcement is expected to see the instant asset threshold to increase to $30,000 and will apply from 2 April 2019 (7:30pm AEST) to 30 June 2020. Currently, small businesses with an aggregated turnover of less than $10 million can access this concession however the budget announcement is looking to extend this concession to medium sized businesses with an aggregated turnover of more than $10 million but less than $50 million. Please take note of the purchase date as this is very critical. This concession will only apply to assets acquired after 2 April 2019 by medium sized businesses (as they have previously not had access to the instant asset write-off) up to 30 June 2020. Any announcements for the depreciation concession will apply from Budget night, 2 April 2019 through to 30 June 2020. From 1 July 2020, the threshold will revert to $1,000 (subject of course to further changes). The Government announced they will defer the Proposed Division 7A* amendments for 12 months. Back in the 2018-19 Budget measure, the Government was looking to clarify the operation of Division 7A integrity rules to ensure it was easier to be complied by taxpayers. By deferring this item, the Government hopes it will allow more time to consult with members on these issues and to refine the Government's implementation approach which will include an appropriate transitional arrangement so that taxpayers are not unfairly punished. *Division 7A: Benefits or payments provided by private companies to directors/shareholders that were not issued by way of a company dividend and was not repaid. Division 7A can also be triggered through Unpaid Present Entitlements (UPE’s) in which a corporate beneficiary becomes entitled to a share of Trust income but has not been paid this amount by the Trust before the Trust’s lodgement day for that income year. The Government is estimated to provide $42.1 million over 4 years to the ATO to increase audit activities to recover unpaid tax and superannuation liabilities. These activities are likely to be focused on larger businesses and high wealth individuals to ensure income tax and superannuation liabilities are paid on time. It is unlikely this will extend to small businesses. The Budget is looking to exempt the contributions work test for individuals aged 65 and 66 who will now be able to make voluntary superannuation contributions from 1 July 2020 (both concessional and non-concessional). Currently, individuals aged 65-74 must work at least 40 hours in any 30-day period in the tax year that the contributions are made (the "work test") to make any voluntary personal contributions. This proposal means individuals aged 65-66 who may work one day a week or volunteer can make voluntary contributions to superannuation and giving them greater flexibility as they near retirement. It is expected 55,000 people aged 65-66 will benefit from this reform in 2020-21. It should also be noted that the age limit for making spouse contributions will be increased from 69 to 74. · A promise to cancer patients to cut $2.3 billion out of pocket expenses and to extend Medicare to help cancer sufferers as well. This will cover up to 6 million free cancer scans, 3 million appointments with specialists and affordable medicines. · After the Government revealed a $1.6 billion cut on National Disability Support Scheme (NDIS), the Labor party intends to lift the cap on staff members to ensure enough support. 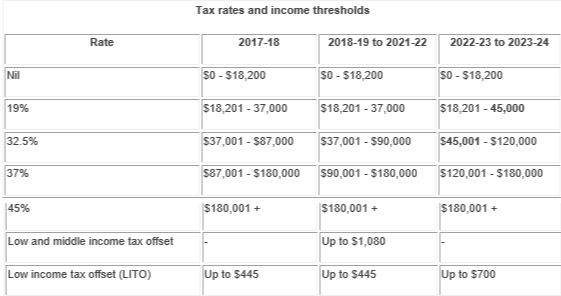 · Labor does not agree with the Coalition’s plans to reduce the tax rates by 2024-25 (per Item 3 above) nor should someone earning $200,000 pay the same tax marginal tax rate as a $45,000 taxpayer. The Labor party would not implement this if elected office. - Increasing the low income tax offset from $200 to $350 for those earning up to $37,000. - Offset to increase and peaking to $1,080 for those earning between $48,000-$90,000. 1. Thomson Reuters Weekly Tax Bulletin, Special Issue – 2019 Federal Budget Report (Issue 14), 2 April 2019.